Today was my first full day in Greece, a country I have always wanted to visit. I couldn’t wait to see what the beautiful ancient city of Athens had to offer. After getting up this morning, Dad was nice enough to bring Jeff and me some breakfast to the room. The three of us left about 8:30 a.m. by taxi to the foot of the Acropolis. We strolled the pedestrian street Dionysiou Areopagitou as we climbed up the Acropolis. The Acropolis is bigger and more complex than I imagined it to be. In my mind, I expected it to contain the Parthenon and a few other buildings. It turns out the citadel is the home of more than 20 other temples, monuments and structures. It is almost a complete separate ancient religious city peering down on Athens below. In fact, the word Acropolis (Ακρόπολις) means “high city” in Greek. The Acropolis opens at 8 a.m. and admission is about 12. A quick visit to the Acropolis can be done in around 90 minutes, but that would be rushed. We opted for more time than this. As walking up the south slope of the Acropolis, we first arrived at an overlook of two ancient theaters. 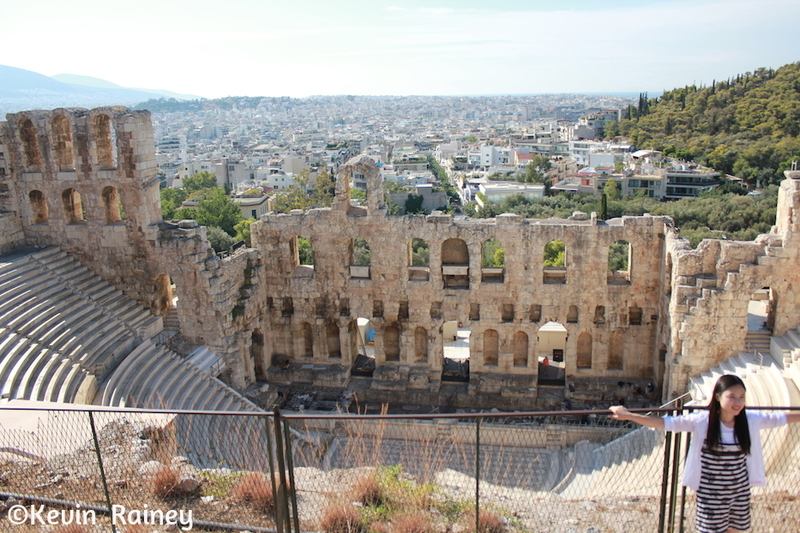 Directly below us, we gazed at the Odeon of Herodes Atticus (ᾨδεῖον Ἡρῴδης Ἀττικός), and to our left, the Theatre of Dionysos (ᾨδεῖον Διονύσου Ελευθερέως). The Odeon of Herodes Atticus is massive and entertained thousands of spectators in Ancient Greece. The Theatre of Dionysus is the oldest ancient theatre of Greece and was the main theater of old Athens. This roofed Odeon served mainly musical festivals, and could host up to 5,000 spectators! Then we hike upwards with eager anticipation to the top of the Acropolis. Near the entrance on the southeast edge, we walked by the Temple of Athena Nike (Ναός της Αθηνάς Νίκης). The classical temple was built in 426 BC and later protected the entrance to the Acropolis. In ancient times, an altar hosted statue of Athena. As we passed under the gate, the Parthenon (Παρθενώνας) appeared in front of us. It is even more impressive and massive in person. The sun shined magnificently on the marble illuminating all of its intricate carvings and sculptures. The Parthenon, built in less than 10 years from 447 and 438 BC, is considered the greatest monument on the Acropolis. It was designed to impress, which it still does today. 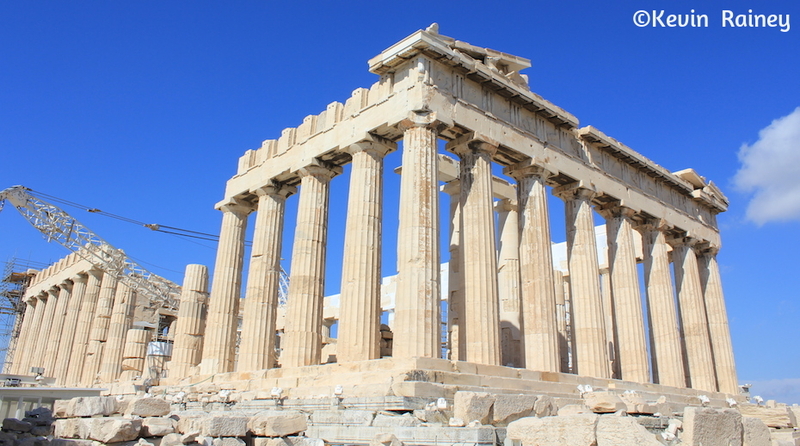 The Parthenon represents the Athenian democracy at the height of its power. 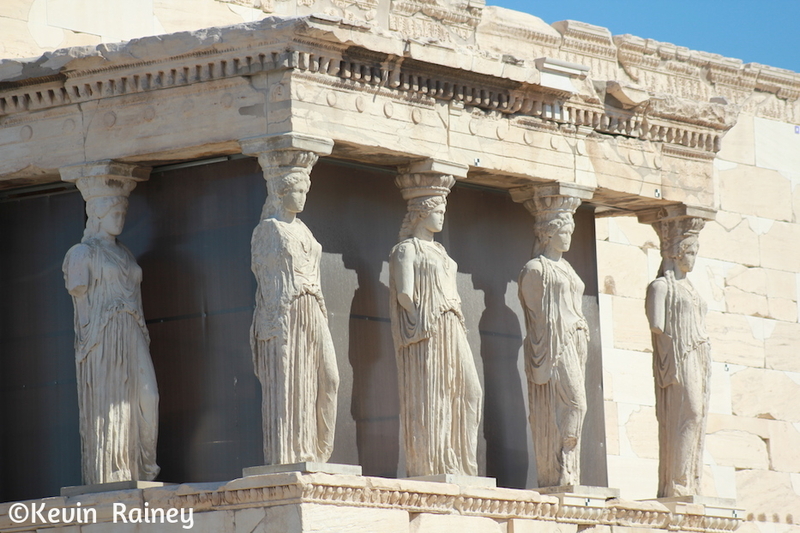 The temple was dedicated to Athena Parthenos, the patron of Athens. This classical Greek style of building would later influence other such as the Romans as they built their public buildings. So if you admire the style of your federal courthouse and the Wall Street Stock exchange, you have the ancient Greeks to thank for their prodigious building. 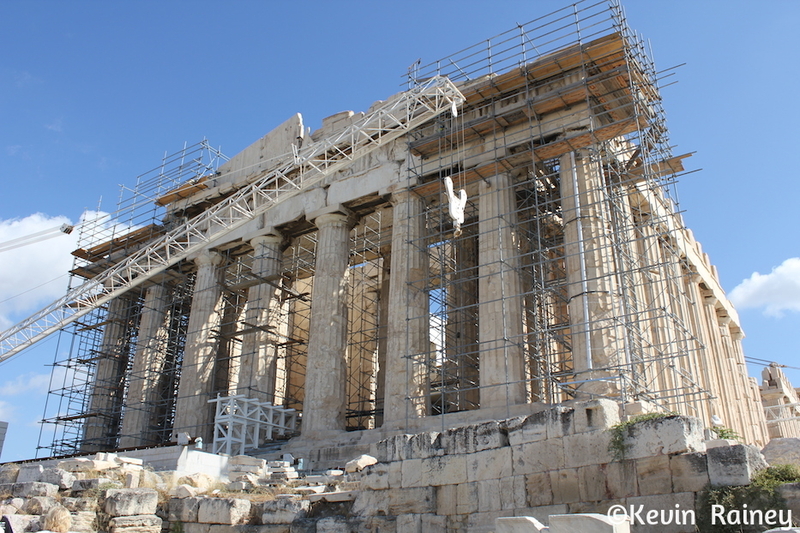 One thing I didn’t know was the story of why the Parthenon is so badly damaged today. During September 1687, the Venetians laid siege to Athens, which was then under Ottoman control. The Ottoman Turks used the Parthenon as an ammunition depot. On September 26, a Venetian shell landed in the Parthenon and the structure shook with a tremendous explosion. Much of the damage you see today was caused by that shell igniting the gunpowder. I had seen some of the surviving marble “Elgin” sculptures – named after the Earl of Elgin – previously at the British Museum in London. I could somewhat imagine how beautiful this temple must have been back in Ancient Greece because I have seen the full-scale replica in Nashville’s Centennial Park with its statue of Athena. To the west of Parthenon’s south end, we saw the Pedestal of Agrippa (Βάθρο του Αγρίππα). The pedestal of Agrippa is about the same height as the temple of Athena Nike and was built in honour of Eumenes II to commemorate his chariot-race victory in the Panathenaic games. Atop the pedestal there was once a bronze, four-horse chariot driven by Eumenes and his brother, Attalos. Also to our left, we admired the Propylaea (Προπύλαια), or gate. The current gate was rebuilt in 480 BC after the Persians destroyed the previous gate. We also visited the Erechtheion (Ερέχθειο). This beautiful building was built in 421 BC and was named after Erechtheus, a mythical Athenian king. 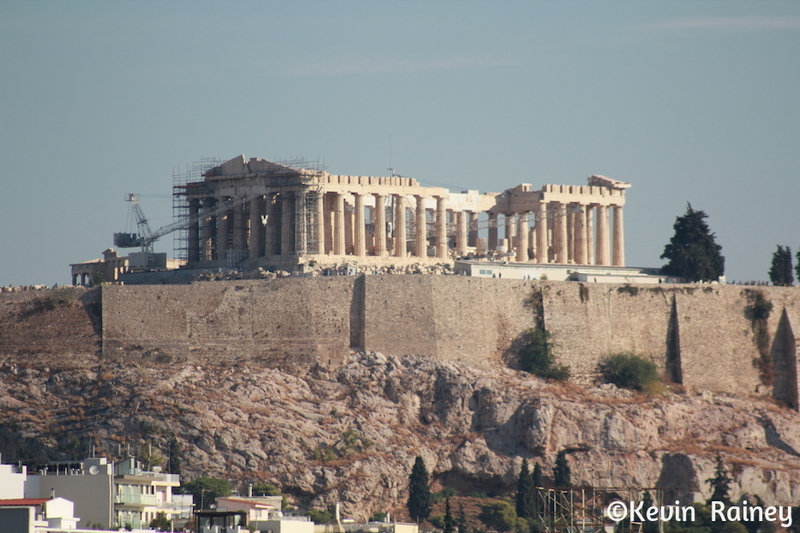 As we strolled around the south side of the Acropolis, Dad, Jeff and I were awed by the views of the Athens. The city seemed to sprawl out endlessly below us as far as the eye could see. Below us we saw the Temple of the Olympian Zeus (Ναὸς τοῦ Ὀλυμπίου Διός), an impressive temple dedicated to Zeus, the father of the gods. It’s massive and the biggest of Athens’ ancient temples. Off in the distance we saw the imposing Mount Lycabettus (Λυκαβηττός), which at more than 900 feet, is Athens’ highest point. On top its two peaks is the Chapel of St. George and a well-known theater where many famous artists have performed. After an enjoyable visit to the Acropolis, we descended south down to the Ancient Agora (Ἀγορά), or market. The Athens Agora made up the heart of ancient Athens and its political, commercial, administrative and religious activity. We walked through the Panathenaic Way through the ruins of the Agora. One highlight was seeing the Hephaisteion (Ναός Ηφαίστου). 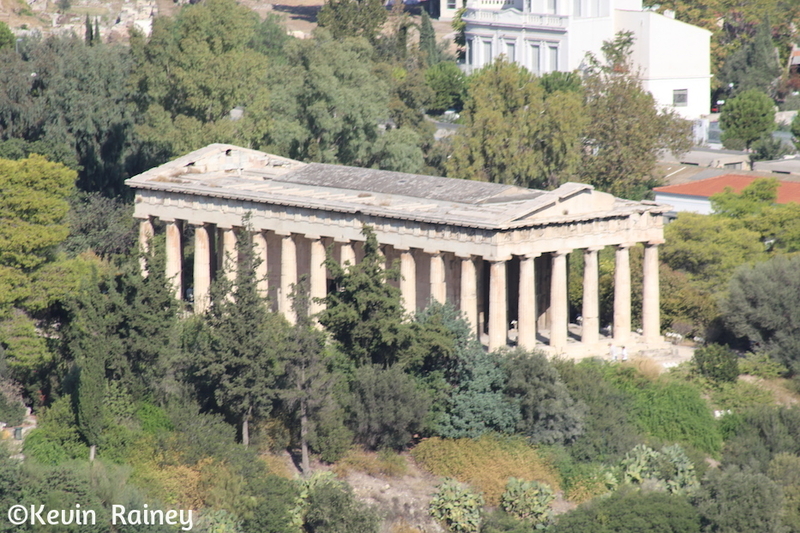 This Doric-style temple was dedicated to Hephaestus in 415 BC and is much better preserved than the Parthenon. From the 7th century AD to 1835, it actually served as a Greek Orthodox church! Overall, it was a fantastic walking tour of ancient Athens. We grabbed a taxi near the Agora and headed back to Ledra. Mom had checked out at noon and booked us a transfer to the port of Piraeus, about €20 for the 45-minute ride. Then we loaded up in our taxis and headed off for our cruise! Upon arrival in Piraeus, we were surprised at how massive the port was. But what blew us away was seeing the magnificent msy Wind Surf yacht we were about the board. 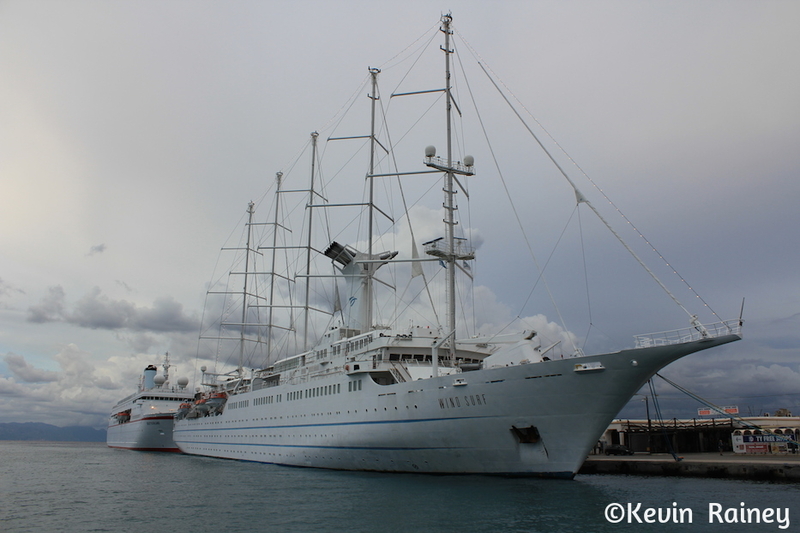 The luxurious boat is the world’s largest sailing cruise ship and is the flagship of Windstar Cruise Lines. The five-masted yacht was normally too expensive for me, but we scooped up a last-minute bargain before leaving the U.S. Due to the Greek austerity crisis and it being the end of the Aegean cruise season, we were able to book it for 83 percent off! Jeff and I were going to enjoy our first-ever cruise in luxury! After checking into our rooms, we set sail around 5 p.m. The Wind Surf takes cruising to a different level. Built in Le Havre, France, the ship can carry 310 passengers with a crew of 214. It’s a massive 636 feet long and also features two diesel-electric engines in addition to computer-operated sails. The boat also has two sets of stabilizers to deliver a smooth sailing. Our stateroom was amazing. We had twin beds, satellite television, a DVD player, refrigerator, minibar, a phone, private bathroom and even our own robes with the Wind Surf crest. Our steward’s service was amazing. He even turned down our bed and left us a piece of chocolate on our pillows. On board, the amenities are incredible. We have a main lounge, casino, library, fitness center, the WindSpa, business center, The Bistro, The Restaurant, The Veranda (breakfast and lunch), The Terrace (breakfast and lunch), Compass Rose (breakfast and afternoon tea) and shopping. On the decks, we had two salt-water pools, two hot tubs, a bar and a lower water-sports platform. The boat offers complimentary waterskiing, windsurfing, kayaking and snorkeling, but it was too cold in October for these activities. 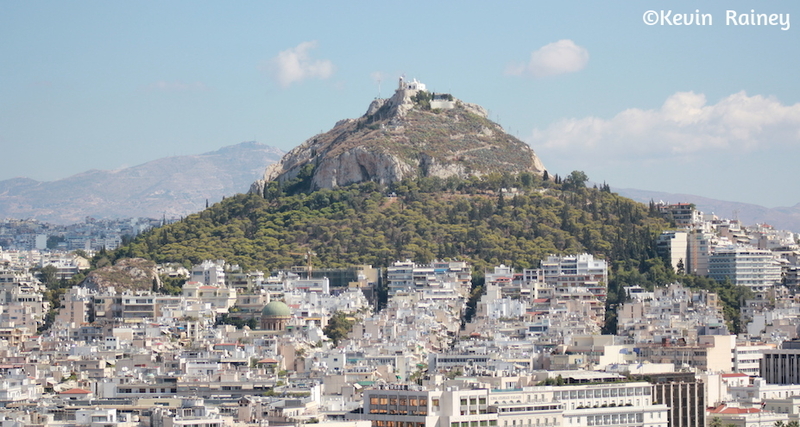 We admired the beauty of suburban Athens as we sailed out of the port of Piraeus. In the distance, we could even see the Parthenon and illuminated Acropolis during sunset. The ship’s speakers on decks played its normal departure song “1492” by the Greek composer Vangelis from the movie “1492: Conquest of Paradise.” It was going to be a magical voyage of discovery for us as well. We only hoped that the Wind Surf wouldn’t meet the fate of Columbus’ Santa Maria!